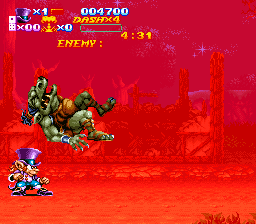 Nightmare Busters is an unreleased game that was developed by Arcade Zone. In Japan, it was planned to be published by Nichibutsu. Thanks to Retromags for the scans! 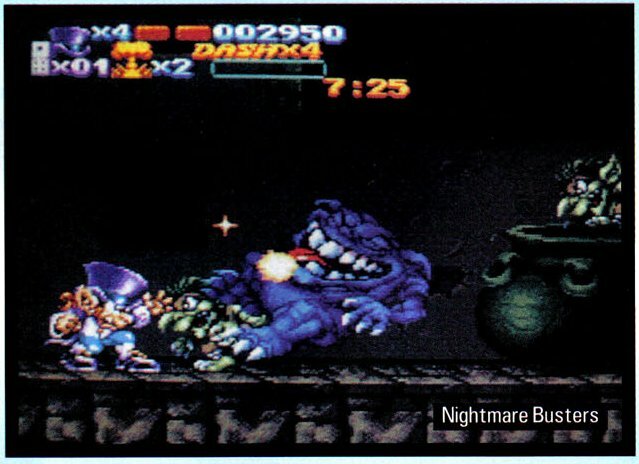 Nightmare Busters is an action shooter game, in development by the London-based studio Arcade Zone, and was to be published by Nichibutsu. According to an interview on 1up Games, Arcade Zone had a publishing agreement with Sony in Europe, and when Sony decided to bring out the Playstation and abandon Nintendo consoles, it became impossible to continue running the studio. At that point, they had to stop working on Nightmare Busters, even though it was almost finished. A version of the game eventually came out on mobile phone platforms in 2004, as Flynn's Adventure. 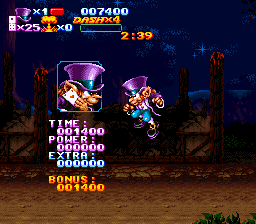 One notable thing about this game is that an official bootleg was released by Super Fighter Team, which you can still purchase. The bootleg was originally announced in June 2010, but it wasn't until December 2013 that it actually came out. Buyer beware, there were many people who got it that reported on Nintendo Age that the bootleg is poor quality. The bootleg release is unchanged from the prototype. 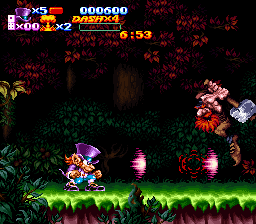 Gameplay-wise, it is perhaps comparable to a cross between Super Ghouls 'N Ghosts and Contra. 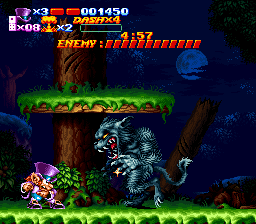 A commentator on Unseen64 noted that the game is likely inspired by the Capcom arcade game, Midnight Wanderers. With the amount of enemies, you have to be quick hitting the fire button! 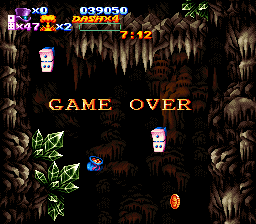 I played it a bit, getting to the third level on the easiest difficulty. 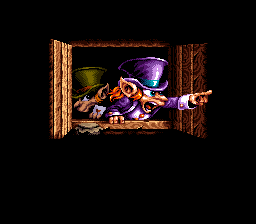 The game had some glitches in it, indicating either a bad dump, or simply a bug. I would lean towards it being a bug, since it looks like it has just loaded the wrong graphics tiles. The sound and graphics are excellent, and aside from some balance issues (namely that the game has a lot of unavoidable hits), it appears pretty close to completion. Cutscenes happen before each level. It looks very much like there is supposed to be text there, but it isn't programmed in yet. This looks very much like the spot that is in the Nintendo Power coverage (see below). Definitely more advanced in this prototype. Burning building. It is ridiculously hard to get past this without getting hit. 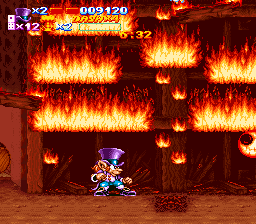 You can try sliding under the flames, but it doesn't work well. 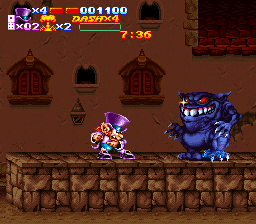 Boss battle. 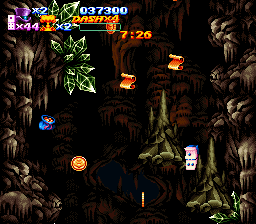 The first boss is not easy, especially if you lack a firepower upgrade. Score sheet. 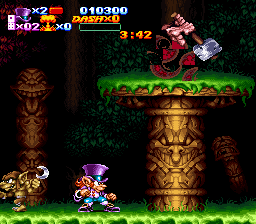 Second stage, fighting a dude with a hammer. Preparing the dash. It is very effective, but you can only use it a limited amount of times. This is was about as far as I got. 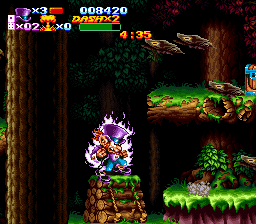 Some spikes fall down after you, but as far as I can tell, you cannot go fast enough to avoid them. And so I died. Duofan found a prototype of a near final version of the game, which he originally posted about on the Digital Press forum in 2007. There was a fundraiser on the Assembler Games forum which saw the prototype of the game get leaked sometime around 2010 (although I was unable to find the original thread). 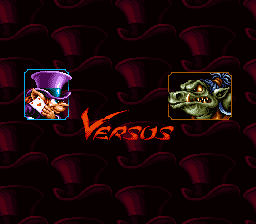 The official bootleg, as mentioned above, is identical to the prototype. I have binaries both with and without a fixed checksum in the header, I would assume the unfixed version was what was on the original prototype. The game was shown at Shinshokai 1994, and made it into Nintendo Power's 1995 preview issue.